Oil on canvas, 14 1/8 x 10 1/16 in. 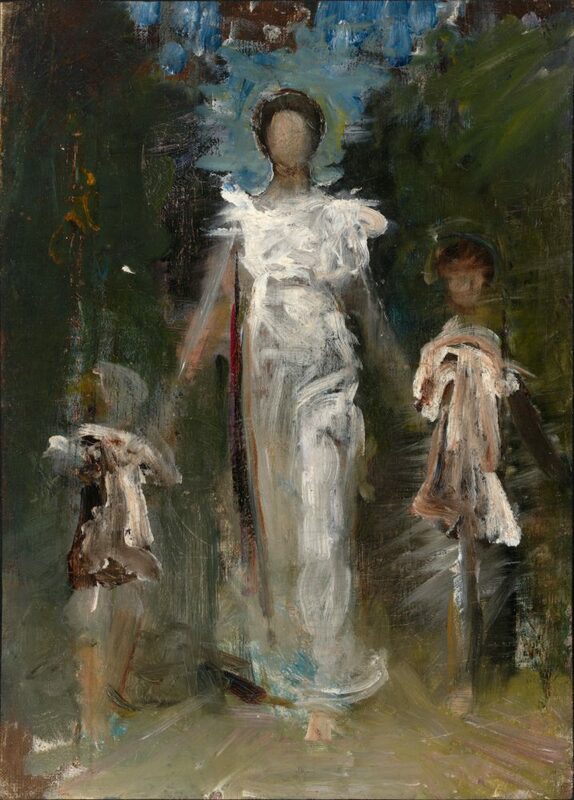 This work depicts Thayer’s three children Gladys (left), Mary (center), and Gerald (right) against a wooded background with blue sky surrounding Mary’s head, creating a halo effect. Mary Thayer wears a chiton-like garment and strides forward with her right leg. The painting includes Thayer’s idiosyncratic and ebullient facture that is characteristic of his mature style. Parts of the canvas are thickly painted with a loaded brush, while other areas appear to be scraped away or perhaps blended with a palette knife or smeared with a finger, making the figure–ground relationship ambiguous particularly around the figures. The painting is an oil study for A Virgin (1892–93; Freer and Sackler Galleries, Smithsonian Institution, Washington, D.C.). The green background and the central figure’s isolated head against blue also recalls My Children (c. 1897; Smithsonian American Art Museum, Washington, D.C.). It appears that Thayer abandoned the idea of placing the three figures in A Virgin in a wooded setting, opting instead for the expansive sky and clouds in the finished work, but then employed the background composition from this study in the later painting My Children. The final version of A Virgin at the Freer and My Children both exhibit this same spatial vagueness around the figures seen in this study. Portions of My Children are similarly ill-defined and scraped away as in this study, indicating Thayer’s loose relationship to the concept of “finish” as it would have been understood in American art around 1900, even in monumental works sold to his major patrons. Abbott Handerson Thayer’s work is difficult to place neatly into the trajectory of American art at the turn of the twentieth century. Like many of American artists of his generation, he studied at the École des Beaux Arts in France with Jean-Leon Gerome but upon his return to the United States he began exploring subjects and working in a style that diverged significantly from his peers. The subtle effects of graduated color in his mature works links him to the Tonalists. Thayer’s subjects of winged figures, however, have a gravitas not present in his peers’ more aestheticized work. His angels and idealized figures of women are closer to the work of painters and sculptors associated with the so-called American Renaissance including Edwin Blashfield, Kenyon Cox, Daniel French, Augustus Saint-Gaudens, and Elihu Vedder.